The Church reform of the high middle ages was a movement of the highest significance to European culture and society. From its beginnings as an effort to free monasteries from secular interference, the movement eventually led to a major restructuring of the relations between the institutional Church and the laity, the general population. The effects of reform and its underpinning ideology can be seen in the growth of papal power, the rise of new religious orders, increasing concern with heresy, and the crusades. For us, here, however, of particular importance was a newfound emphasis upon clerical education and a corresponding search for intellectually satisfying and rational bases for Christian doctrine. Without these parallel developments within the Church, the achievements of early modern science would probably have been impossible. The big, new ideas of high medieval academia were Aristotle’s. The Romans seem never to have bothered to translate his work into Latin, for the simple reason that if a Roman were to be interested, he would certainly already know Greek.6 For this reason, Aristotle remained almost completely unknown to medieval European scholars until Latin translations from Arabic versions of his texts began to filter across the border from Spain in the twelfth century. 7 Aristotle’s thought transformed the medieval intellectual world. His was a comprehensive philosophical system of enormous persuasive and explanatory power: through a combination of logic, empiricism, and basic principles, his system was capable of explaining almost anything. Even better, because Aristotle explained the workings of the cosmos without reference to supernatural power (“philosophical naturalism”), his thought, for the most part, did not contradict Church teachings. There were a few exceptions—Aristotle denied the immortality of the soul, for example—but since, as a pagan, he was not expected to be an authority in theological matters, these errors could be ignored. Indeed, it did not take long for Christian scholars to realize that Aristotle’s philosophy could provide insight into all aspects of the natural world, even those that impinged upon religion. The classical universe from a sixteenth-century cosmographical treatise. At the center is the earth and spheres of water, air, and fire, then the transparent crystalline spheres of the seven planets and the fixed stars. For medieval scholars, this way of understanding the physical universe was the key to solving a famous riddle: it was then a doctrine of the Church, as it remains for modern Catholics, that during the Mass, the Host, which is the consecrated bread, is miraculously transformed into the literal body of Christ prior to being consumed by the faithful. But if this is true, a cynic might ask, why does the bread still look and taste just like bread? Aristotle’s matter theory provided the answer: the substance of the bread was transformed into the very substance of Christ, while its accidents, its externals, remained those of bread. After a certain amount of debate, this process, called “transubstantiation,” was accepted as the necessary way to understand the Eucharist or communion.9 This was just one of the ways—although perhaps the most important—that Aristotelian philosophy was turned to the service of the medieval Church. Similarly, theologians used Aristotle’s rules of logical deduction and physical science to prove the existence of God, to explain the divine paradox of the trinity, and to provide a rational explanation of how Christ could be both wholly human and at the same time completely divine . 1 Michael Shank, “Schools and Universities in Medieval Latin Science,” in David Lindberg and Michael Shank, eds., The Cambridge History of Science, vol. 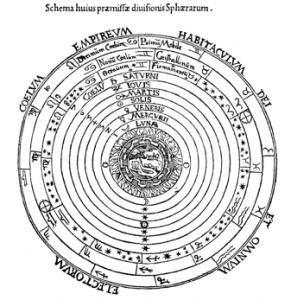 2, Medieval Science (NY: Cambridge UP, 2013): 207-239; 210. 2 For the origins of medieval universities, see Shank, 207-239. 4 Kay Slocum, Medieval Civilization (Belmont, CA: Thomson Wadsworth, 2005), 376. 7 Edward Grant, “Reflections of a Troglodyte Historian of Science,” Osiris 27.1 (2012): 133-155; 136-137. 8 Edward Grant, “Cosmology,” in David Lindberg and Michael Shank, eds., The Cambridge History of Science, vol. 2, Medieval Science (NY: Cambridge UP, 2013): 436-455. 9 Stephen Gaukroger, The Emergence of a Scientific Culture: Science and the Shaping of Modernity, 1210-1685 (Oxford: Oxford University Press, 2006), 65. 10 David Lindberg, “Science and the Medieval Church,” in David Lindberg and Michael Shank, eds., The Cambridge History of Science, vol. 2, Medieval Science (NY: Cambridge UP, 2013): 268-287; 279.